Ripple surged more than 43% in past 24 hours to hit a new all-time high of $3.81, according to the data from CoinMarketCap. At the press time, the cryptocurrency is trading at $3.71 with over $8 billion trading volumes and over $140 billion market cap. Over the past one month, Ripple has now crossed three major landmarks – $1, $2 and $3. XRP has recorded the highest growth in 2017, of over 36,000%. 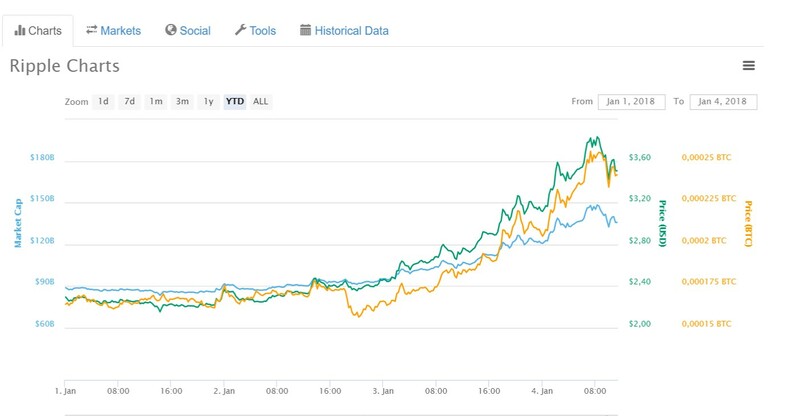 The currency made headlines when it crossed the market caps of Bitcoin Cash (EXANTE: Bitcoin.Cash) and Ethereum (ETH/USD) to occupy the second position. It became the second largest currency by market cap, standing next to Bitcoin. The currency also became the first altcoin to cross the $100 Billion market cap. According to CoinSpeaker, the huge trigger to the Ripple price in past 24-hours can be due to the $100 million XRP Hedge Fund going live. This fund known as the Arrington XRP Capital has been founded by TechCrunch founder Micheal Arrington.